Behavioural biometrics analyses specific human behaviour with intelligent software, adding a new layer of security to verifying identification that is nearly impossible to replicate, without any additional stress for the user. Products and services in this market are moving digital security beyond simple passwords and pin codes, ensuring that as cyber criminals become more advanced, so too do everyday users. Behavioural biometrics analyses patterns of human interaction with electronic devices to design new security tools unique to the individual. It identifies concrete and measurable patterns of human traits such as keystroke analysis and voice authentication. Therefore, as a measurable behaviour that is used to verify a person’s identity, behavioural biometrics offers a safer method of authentication than the current use of passwords and pin-codes, and even more security than standard biometrics, such as fingerprints or face scans. This opportunity space is, therefore, taking cyber security to a completely new level. Products and services in this opportunity space do not measure who you are in terms of, for example, your fingerprints but rather how you act. The products and services are software and applications that can be used across digital devices such as smartphones and computers. It can be keystroke or typing recognition software, which, when installed onto a computer, analyses how you type in terms of speed and rhythm and can determine when other users suddenly appear. There are also software products in this space with algorithms that constantly learn about users’ behaviour and adapts the specific behavioural ID to increase the level of protection. These software products are invisible to the human eye and therefore do not interfere with the user experience. In addition to software integrated into digital devices, other products are wearables such as wristbands that detect a heart’s electrical activity to positively identify a user. Behavioural biometrics can often be gathered using existing hardware, only needing new software for analysis, making it simpler and less costly to implement. It is a dynamic global market for behavioural biometric solutions consisting of numerous large and small players. The Biometrics Research Group Inc. predicts the global biometrics market will grow to 35.5 billion USD by 2020, from its 2015 value of 15 billion USD, making it a significant space for the development of new technology and service delivery. 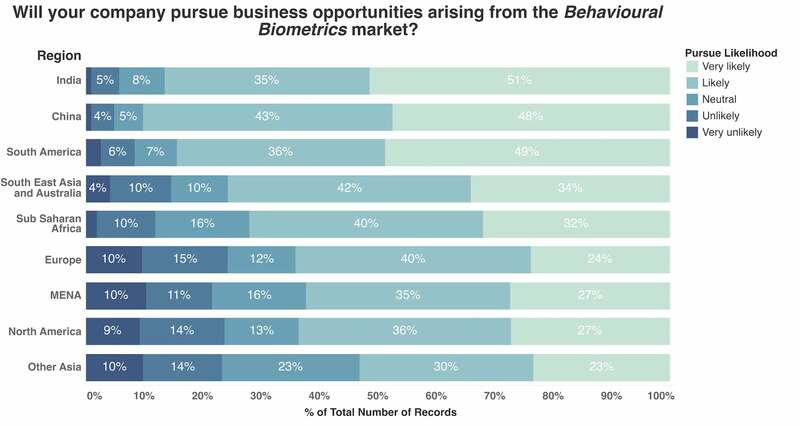 Technavio’s analysts forecast the global behavioural biometric market to grow at a CAGR of 17.34 percent from 2016 to 2020. The governmental sector has been early adopter of behavioural biometrics, accounting for 40 percent of the market in 2015. The application of behavioural biometrics in electronic devices such as smartphones and laptops is expected to drive growing demand across various private sectors, where the financial services industry is currently driving up the demand. The behavioural biometrics market is in a nascent stage compared to biometrics, such as fingerprints and face scans, but the advantages of the new technology give it a strong edge. Utilising behaviour to provide a unique digital ID, and thereby achieve improved cyber security, is a very popular market opportunity in South America, as well as one of the most preferred in the Other Asia region (covering Japan and Russia). However, the market opportunity has achieved lower ratings in other regions. The market opportunity seems to be more appealing to consumers above the age of 30. In general, the 2016 survey respondents agree there already exists a necessary capacity to grow this market. Political capacity is perceived to be particularly higher than technological and economic capacity across all regions. This points to the fact that the public sector is a significant consumer of behavioural biometrics products. Leaders in South America have rated their technological capacity to further develop this market higher than leaders from other regions. Business leaders across all regions believe there is a strong business case in entering this market. While leaders in Europe seem to be most ready to develop this market opportunity, those in Other Asia and South America also perceive this market to hold a significant business potential. 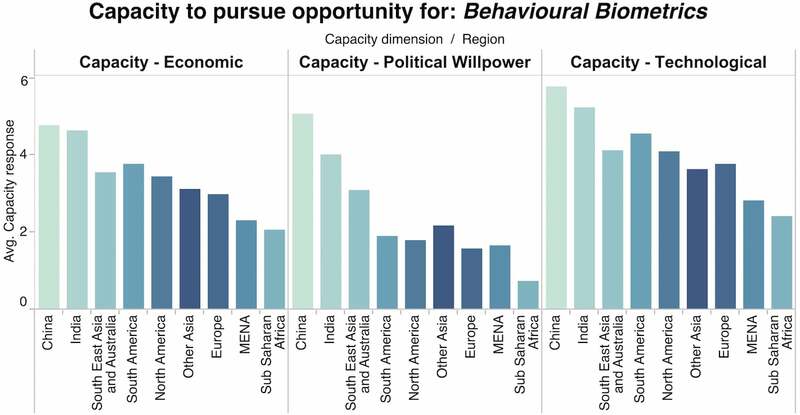 Making use of behavioural patterns to improve cyber security is expected to provide a significant positive impact on business across all regions – for South America and South East Asia & Australia it is the market opportunity with the highest perceived positive impact on business of the 15 markets surveyed in 2016. From a sector perspective, the financial sector and the service industry look most positively at the business case presented by this market. Across all regions, the opportunity is expected to be strongly supported by the financial sector, by policy initiatives, and by business, whereas civil society is not going to be a strong advocate.